Fifteen months ago, when L was born, I ate three meals a day for three days at Water Street Coffee Joint inside Borgess Medical Center. That’s been the only time I’ve eaten Water Street even though there are two other locations not inside a hospital. Our plan for Sunday afternoon was to go to the zoo, but it was raining, so that washed that idea out. For some reason, J started talking about a co-worker who brought back a really good looking sandwich from Water Street a few days ago and I asked if she wanted t0 just go there for lunch. 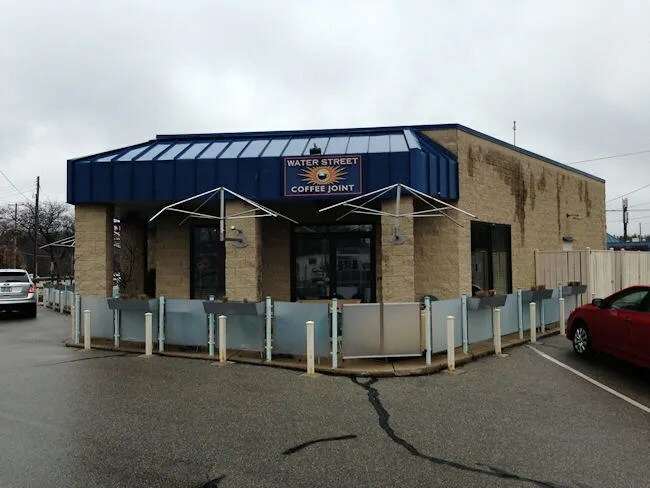 The original Water Street is in downtown Kalamazoo across from Bell’s, but we chose to go to the one closest to us on Oakland Drive right at the intersection with Whites Road in the Oakland/Winchell Neighborhood. The little coffee shop is kind of in a weird spot on a triangle plot of land which makes parking a little odd. For some reason, we were both a little surprised to see a totally packed parking lot…not sure why we were surprised..it is a coffee shop and it was a Sunday afternoon. Is there a better way to spend a rainy Sunday afternoon? Neither J nor I are really coffee drinkers. She will drink one every now and then, but I don’t drink coffee at all. Water Street Coffee Joint has so much more than coffee though, so that part shouldn’t be a turn off. There’s a large cooler case right inside the door near where the cash register is filled with whatever creations they come up with for lunch on that particular day. 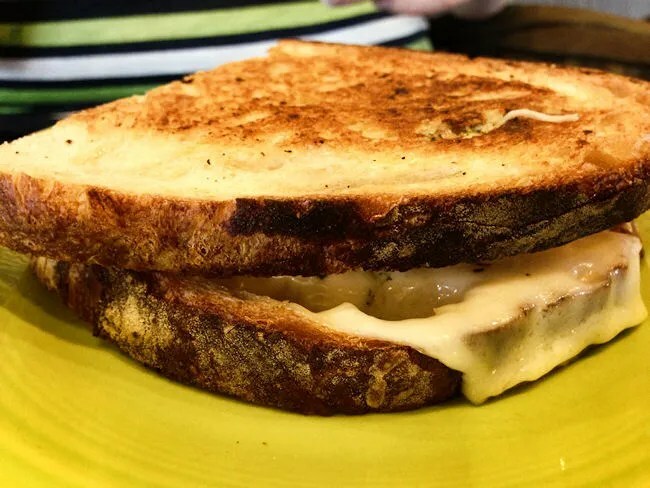 There are usually a few options for panini’s, salads, and savory filled pastries among other things. There are also a plethora of baked goodies and desserts. There were two panini choices for the day and they both sounded good to J and I. One sandwich was a Pesto Chicken panini and the other was a Prosciutto Italian panini. J ordered a half of the Pesto Chicken while I ordered a whole of the other. We also added on a cup of fruit and an oatmeal cookie for L. We also got an iced chai latte for J and I got a bottle of Sprecher Root Beer. The total was a little over $24. The sandwiches are pre made but they need to be put in the panini press to finish off. While that was happening, J took L over to a table and started in on the fruit and cookie while I waited for the latte and sandwiches. It took about five minutes before I was handed two real plates with the food. 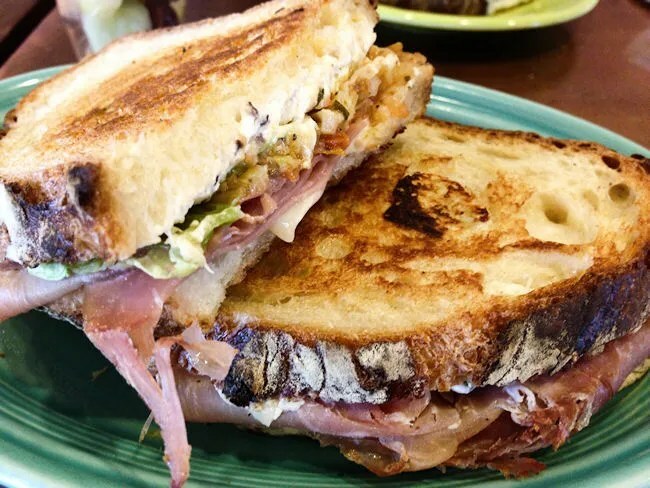 By far, the best part of both of our sandwiches was the deliciously toasted, buttery, crusty bread. You could put almost anything between those two slices and have a winner. My sandwich came with some sort of herbed cheese spread, slices of proscuitto, lettuce, and an Italian relish. The cheese was a little much for me, but it worked well with the saltiness of the meat. The sandwich was delicious. J’s sandwich was a lot of the same, but with a pesto spread and chicken on the same delicious bread. She was fighting L a little bit because the baby really wanted to see what the man next to us was doing. She did have time to tell me that the sandwich was yummy. She didn’t really get to eat anything when she was in the hospital so this was really her first experience with Water Street. 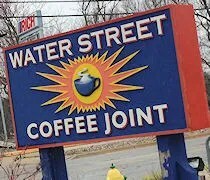 If you’re not a coffee drinker, don’t be scared by the coffee joint part of Water Street’s name. They have an incredible selection of food that shouldn’t be over looked if you’re looking for a great lighter, non-greasy lunch. I absolutely love their smoothies– they make them without ice cream or yogurt, which is very hard to find! I highly recommend trying one on a hot summer day!